It is well known that the average graduate earns more than non graduates, and that university graduates from certain subjects and from certain universities earn considerably more than others. 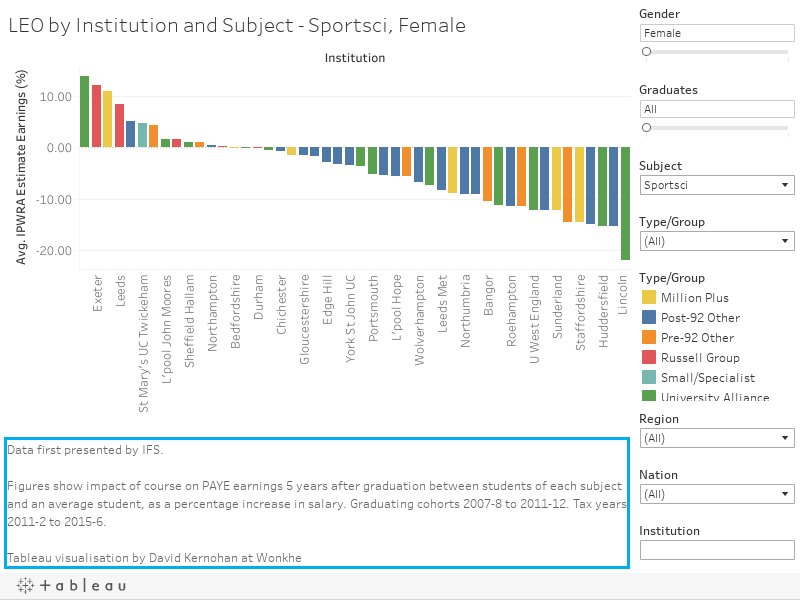 For example, five years afer graduation, men from the highest earnings universities earn almost 50% more than graduates from other Russell Group universities (30% for women), while male Russell Group graduates earn over 40% more than those who attended the average post-1992 institution (35% for women). But to what extent are earnings differences across university courses down to the course itself, and to what extent are they due to differences in students doing the courses? In this research, we use a new dataset of school, university and tax records created by the Department for Education to investigate returns to different degree courses. We examine the raw differences in earnings and the returns to degrees holding prior attainment, socio economic background, region and ethnicity fixed. These results focus on earnings five years after graduation for those in sustained employment. We use PAYE earnings, include HE dropouts and look at cohorts graduating university between 2008 and 2012. Below you can find a summary of the report's main findings and the data behind this as well as a link to the full report on the Department for Education website. New IFS research published by DfE shows for the first time to what extent earnings differences across university courses are down to the course itself, and to what extent they are due to differences in the students doing the courses. We have have a rather oblique and expensive way of instilling general skills at university. It is probably one reason why those from less advantaged backgrounds still earn so much less than their better-off peers doing exactly the same course.